So, how can you make sure your kids look forward to lunchtime when the dinner bell goes? 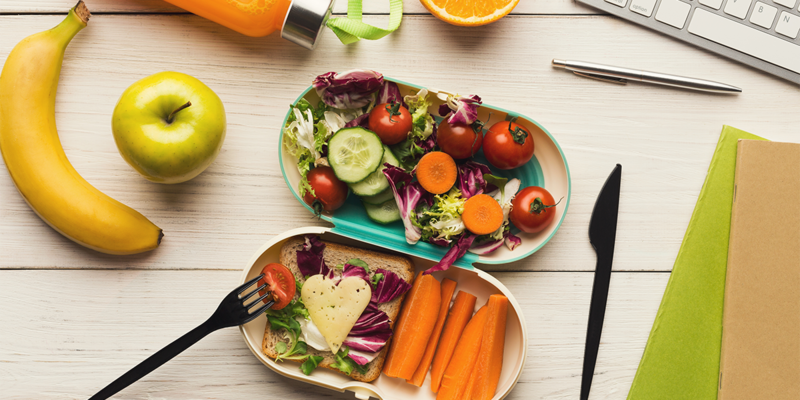 Here’s our tips for packing a healthy school meal so you can get ‘back to school’ with your child’s health. In the UK, over 6 million children tuck into a packed lunch every day at school – that’s over three quarters of all school children! In a 2018 survey carried out by Aviva, whilst 58% of parents believe their home-prepared lunches are healthier than cooked canteen dinners, biscuits, sweets and cakes also proved to be popular additions to the lunchbox. And just over 70% of parents include a bag of crisps every day. Of course, kids deserve a treat once in a while – but the reality is that many packed lunches are choc-full of hidden sugar. It may even be making your child drowsy and tired for their afternoon lessons as they get a sugar crash! Read more on how blood sugar levels affect your health. Shockingly, the research found that just over two fifths of school lunchboxes don’t contain a single portion of vegetables, and 9% don’t even have any fruit. If your child isn’t getting adequate nutrition from their snacks throughout the day, they’ll end up physically and mentally fatigued. That can be quite detrimental for concentrating on their classes, but also lead to slower cognitive development and behavioural problems. So, if your child is acting up, it could be down to what they’re fuelling themselves with. What’s even more important than lunch? Breakfast! Cereal may not be the best choice for your morning meal… So if you’re struggling for ideas, we’ve got 5 healthy breakfast alternatives to fuel you for the day. Nowadays, dinners provided in the school canteen are often somewhat healthier than their reputation. They’ve had a bad rap for being very fatty, sugary and salty – with only chips and pizza. But now, there’s more choice with pasta and vegetable stews on offer in most school halls. However, burgers and cake are often still there as a choice – and it’s still up to your child to choose. If they’re opting for fries instead of broccoli, it can still end up being a nutritional disaster. You also don’t have any control over what they’re eating, whereas with a packed lunch you have input into what your child is consuming. That can be even more important if your child has allergies or food intolerances. A lot of parents don’t have time for organising and preparing packed lunches for every single day – often for more than one child. But it can be made quick and enjoyable – a simple formulaic approach can help speed things up. Invest in a good lunchbox and a lot of different-sized Tupperware – no more soggy sandwiches or lukewarm yoghurts! And a good ice pack can help keep your water cold, so they aren’t tempted by other fizzy, sugary drinks. Get your child involved in coming up with ideas for what they fancy eating. Just make sure it’s aligned with the formula guidelines. You could make it a fun activity, and they’ll get to learn healthy eating habits too! Take the headache out of meal prep by incorporating your evening dinner into the next day’s lunch. Say you’ve got a casserole planned for tea, you can use the leftover veg to make a mixed salad for their lunchbox. Does your child cry for crisps? Offer them crackers or oatcakes. Cakes, sweets and biscuits – how about unsweetened dried fruit like raisins or apricots? A tuna sandwich is great, but sometimes you can get very tired of the same thing every day – and you end up hating it! So, switch it up every once in a while, and try a smoked mackerel wrap, a veggie pasta bake, brown rice and beans, or roasted sweet potato with a leafy salad. Here’s some lunchbox meal ideas we think you’ll love! Manage your and your child’s health from the palm of your hands with the Evergreen Life app. With a personal health record app, you and your child can share health information with each other quickly and easily when it’s needed – that can be very useful for children when they’re away from their parents at school. School is a flourishing ground for nasty allergens like dust mites, mould and not to mention food intolerances! If your child is going off to school with an allergy, you can keep a note of it in their personal health record app to avoid any adverse reactions. They can show it to school staff, so they know what to do in the event a reaction does occur. Take control of your child’s health today.